(February 6, 2009) China’s deadly 2008 earthquake was probably not a natural disaster at all, experts say, but one induced by man – specifically by the four year old Zipingpu dam. This revelation has sent shock waves through the general public and policymakers alike, inside and outside China. Chinese officialdom now realize it will be held to account for building massive hydro dams in China’s seismically active southwest, despite warnings from their own experts. New York Times Sharon Lafraniere has laid out skillfully the rapid development of this natural disaster story to a scientifically enthralling one with the most profound political implications. The Chinese government will no doubt try to keep a lid on its role, and with control over the press and data it might just succeed. It has been keeping secret detailed seismic readings along with the data on Zipingpu’s reservoir levels since its inundation in December 2004 through to May 12, 2008 (fluctuations in, and especially the draw down of, reservoirs is thought to trigger quakes). China would be wiser to release the data for the international scientific community to review. A Columbia University scientist who studied the quake has said that it may have been triggered by the weight of 320 million tons of water in the Zipingpu Reservoir less than a mile from a well-known major fault. His conclusions, presented to the American Geophysical Union in December, coincide with a new finding by Chinese geophysicists that the dam caused significant seismic changes before the earthquake. Scientists emphasize that the link between the dam and the failure of the fault has not been conclusively proved, and that even if the dam acted as a trigger, it would only have hastened a quake that would have occurred at some point. Nonetheless, any suggestion that a government project played a role in one of the biggest natural disasters in recent Chinese history is likely to be politically explosive. The issue of government accountability and responsiveness has boiled over in China in the past year. The grieving parents of thousands of schoolchildren killed in the disaster have already made the 7.9-magnitude earthquake a political issue, charging that children died needlessly in unsafe school buildings approved by negligent or corrupt officials. More public anger erupted last year when the government failed to prevent the sale of tainted milk powder that sickened nearly 300,000 children and killed six. “Any kind of government-related disaster presently is very, very damaging and politically extremely sensitive,” said Cheng Li, the China research director at the Brookings Institution. If it is proved that the earthquake “was related to a man-made situation and not just a natural disaster, the government will be very uncomfortable with that kind of report because of the whole issue of government accountability,” Mr. Li said. Questions about the Zipingpu Dam are especially delicate because China is building many major hydroelectric dams in the southwest, a region which has abundant water resources but is considered prone to earthquakes. In a petition to the government in July, a group of environmentalists and scholars said the fact that government scientists had underestimated the risk of the May earthquake raised questions about a host of other dams built in the same valley and along five other major rivers, according to an article published by Probe International, an environmental advocacy group. Chinese authorities have steadfastly dismissed any notion that reservoir-building in Sichuan Province placed citizens at any added risk, and they have blocked some Web sites of environmental groups that suggest that dangers have been overlooked. In a December article in the Chinese magazine Science Times, two scientists from the Chinese Academy of Sciences strongly denied that the dam played any role in the earthquake. “The earthquake research community outside and inside China has widely accepted the notion that the May 12 Wenchuan earthquake was a huge natural disaster caused by massive crustal movement, because no reservoir triggered-quake with a magnitude eight has ever occurred in history,” said Pan Jiazheng, an expert in hydroengineering, according to a translation published by Probe International. Scientists generally agree that a reservoir, no matter how big, cannot by itself cause an earthquake. But Leonardo Seeber, a senior scientist with the Lamont-Doherty Earth Observatory of Columbia University, said the impact of so much water could hasten an earthquake’s occurrence if geological conditions for a quake already existed. He said the best known example was a 1967 earthquake triggered by the Koyna Dam in a remote area of India, with a magnitude of about 6.5 and a death toll of about 180 people. Mr. Seeber said that while the link between the Sichuan earthquake and the Zipingpu Dam was not yet proved, work by Christian Klose, a Columbia University researcher specializing in geophysical hazards, suggested the stress caused by the water’s weight might have hastened the quake by a few hundred years. Fifty stories tall and big enough to hold more than one billion cubic meters of water, the Zipingpu Dam astride the Minjiang River was billed as one of China’s biggest water control projects. Officials said the $750 million project, part of a grand plan to develop regions in China’s south and west, would generate 760,000 kilowatts of electricity, irrigate more farmland, help control flooding and provide more water to industries and residents of nearby Chengdu, a city of more than 10 million. Almost as soon as construction got under way in 2001, one expert, Li Youcai, voiced fears that officials were underplaying the risk of a major earthquake in the region, but government officials rejected his argument, according to an article published last year on China Dialogue, a Web site devoted to environmental news. Officials allowed the reservoir to fill with water in late 2004. Fan Xiao, a chief engineer with the Sichuan Geology and Mineral Bureau, said that from late 2004 to late 2005, the data showed 730 minor earthquakes, with magnitudes of 3 or less. When the major earthquake struck last May, it originated 3.4 miles from the reservoir. The rupture in the Earth’s crust stretched for 185 miles, initially moving in a direction that Mr. Klose said was consistent with the pressure from the water’s weight. Mr. Fan, the chief engineer for the regional geology investigation team, told reporters soon afterward that he believed that the reservoir influenced the timing, magnitude and location of the earthquake. “The main lesson is that in building these kinds of projects we need to give more consideration to scientific planning and not simply consider the electricity or water or the economic interests,” Mr. Fan said. The debate reignited in December when two scientists with the China Earthquake Administration and three other researchers published a study in the Chinese journal Seismology and Geology. They concluded only that the weight of the reservoir’s water and diffusion of water from the reservoir below the Earth’s surface “clearly affected the local seismicity” over a period of nearly four years before the fault ruptured. The Chinese researchers called for further study to see whether the reservoir helped trigger the earthquake. One of them, Du Fang, with the Sichuan Earthquake Administration, said Thursday that it was impossible to know whether the reservoir influenced the earthquake without more research. “The possibility exists,” she said. 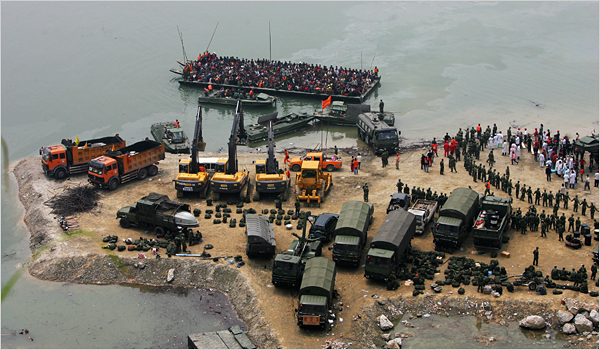 Photo: Survivors of the Sichuan quake in China arrived at the Zipingpu Dam, left, on May 16, 2008.